Typeracer International Ready for Next Step–Seeking Typist Volunteers from Around the World! This page has moved. Visit this blog post instead. Thanks! Not a good way to translate, but it was the best we could do at the time. As some of you may remember, Typeracer International was first created in 2009. At the time, we used Google Translate to automatically translate the English texts into all the other languages on Typeracer. We’ve made an effort to improve these, and people have offered to assist, but we didn’t have enough resources to coordinate this kind of large-scale project while also keeping up with fixing bugs, developing new features, staying compatible with new browsers, etc. 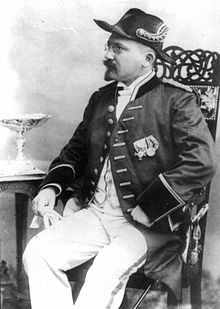 German polyglot Emil Krebs spoke 68 languages, but we at Typeracer do not. So, we need your help! We hope that in the future, Typeracer can use real content from all of these countries and languages, making Typeracer truly international and showcasing the beauty of our world community–in the one way we at Typeracer can! The good news, though, is that we are now ready to take on this project! Of course, the Typeracer team does not speak 50 languages, so we can’t do it alone! As I mentioned last week, we will be looking for volunteers to oversee the collection of texts in other languages, and this project is officially launching now! 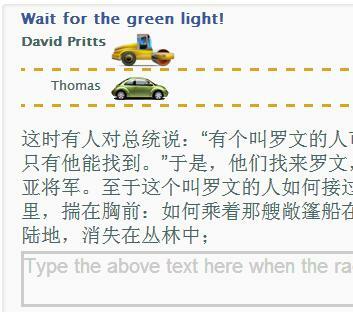 We hope to create small teams to collect texts in each language. Each team-member will contribute his or her favorite texts, as well as review the texts suggested by other users in the same language; this is to assure quality, meaning that the texts should be fun, interesting, and appropriate (no profanity, no offensive content, and nothing that is unsuitable for young users). After all the members of a language team have approved all the texts (and removed any that they can’t agree on), the team leader (to be selected by the Typeracer team) will submit them to the Typeracer team for use on the site. Thanks, and I look forward to racing some of you in other languages soon! TypeRacer turns 5 years old and reaches 1 million users! Today makes exactly 5 years since TypeRacer began accepting signups for user accounts, and coincidentally, we’ve just reached the milestone of 1 million accounts created! I want to thank everyone for signing up and racing over the years: you guys have literally changed my life! Update 2: Due to the high demand, we’ve decided to keep this offer open for a full week (until Thursday, August 15th). Thanks to everyone who subscribed! I’d like to also personally thank David Pritts, who signed up (as valikor) as soon as TypeRacer started accepting signups, has completed over 23 thousand races in the last 5 years, and has recently joined me as the second member of the TypeRacer staff! I asked David to write about his experience on TypeRacer as a 5-year veteran, and about some of the future improvements we have planned. David, thank you, and happy anniversary! 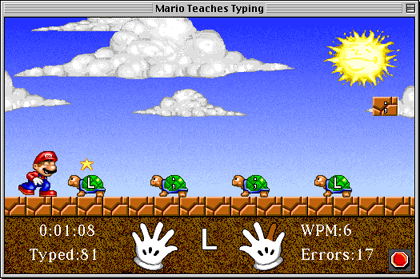 Like many others in my generation—when personal computers began to become common—I first started typing in elementary school, with games like “Mario Teaches Typing”, and later using typing tutors like Mavis Beacon. Looking back, even 15-20 years later, I can still remember playing the Mavis Beacon “car game”, where fat, juicy mosquitoes would splatter on my windshield with each typo, at times leading to my horrific death. Luckily, computer games at this time had very bad graphics, so I was spared the bloodshed after each crash. Does anyone remember this typing game? 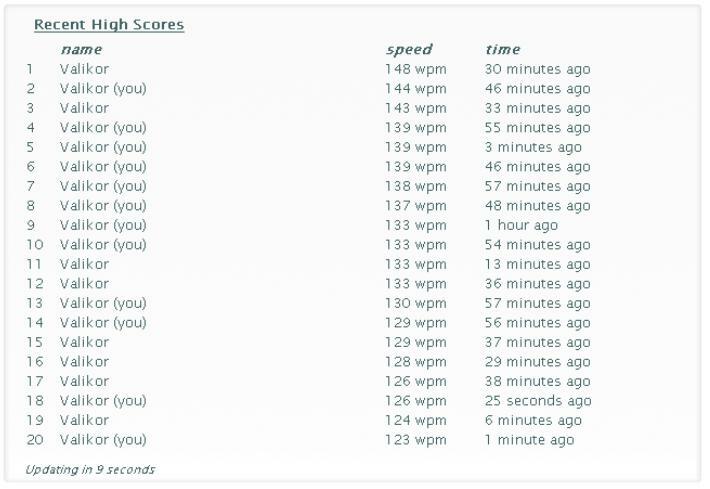 By middle school—probably when I was around 12-years-old—I typed about 80wpm; at the time, I was quite proud of this, because I was just surpassing my father, who had been using computers for years. By high school, I typed maybe 115 wpm, and would occasionally go to one of our school’s computer labs during my free periods and play on the software that was used for typing classes. There was, I think, something refreshing and relaxing about the whole practice; after all, computers, unlike people, are predictable. The keys that you press always correspond to the letters that come up. It doesn’t require a lot of thinking. You just go. By the end of high school, I would say that typing had become one of my hobbies, albeit kind of a boring one. I had learned the Dvorak keyboard by this point, and could type “fluently” on two keyboard layouts (Dvorak and Qwerty), but there were no competitive typing games online, and no communities for typing enthusiasts. I considered launching such a website, actually, but this idea—like a thousand others—disappeared into the hungry abyss that is my mind. Fortunately, though, I was being a typical American college student one day, procrastinating with my schoolwork, when I stumbled across a new typing site called www.typeracer.com. The site was quite good, as it allowed users to race in real-time against users all over the world. All the data was stored in cookies, though, with no permanent records; there were no user accounts, and there was no way to communicate with other users. 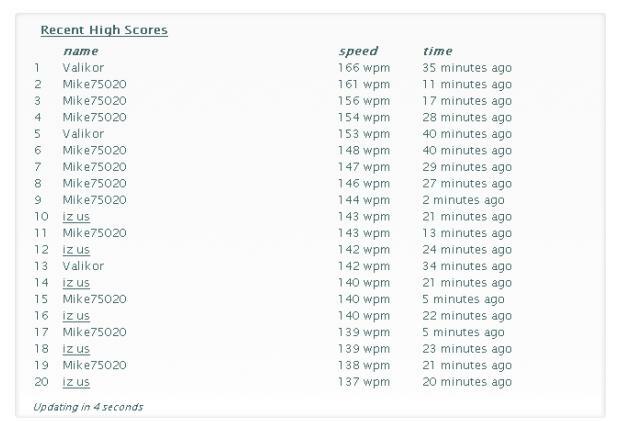 At the time, each user could occupy an unlimited number of positions on the leaderboard, so this “fastest typists” list was often dominated by the 2-3 fastest typists of the hour. The old scoreboard system only worked well for a few people at a time. Or sometimes, if certain people wanted to boost their egos, they would find a time when nobody faster was logged on, and they would completely dominate the leaderboard. It was nice for some people who wanted an ego-boost. At the time, I may have been a little overly enthusiastic. The game was a lot of fun, but the site was still in beta, and needed a lot of work, as there were a lot of random bugs. Huh? Two different scores? Typeracer still needed a lot of work. Dangerous times. This was like the Wild Wild West phase of Typeracer history. 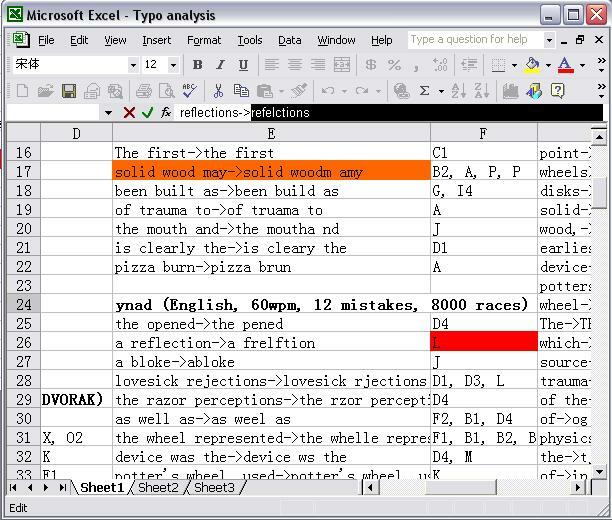 Over time, though, Typeracer became more stable, and added more features. The scoreboard became more fair, only displaying each user’s highest score. The biggest day, however, was August 8th, 2008. This is when Typeracer introduced permanent user accounts, officially bringing it into post-beta. A few old-time users will remember this day. Since then, we’ve seen massive expansion. The community has grown extensively, with typists all around the world registering. 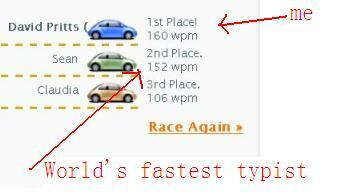 Many notable users from other typing competitions, including large-scale international competitions, have also made themselves present on Typeracer. Over these past five years, the changes have been enormous. Typeracer has improved stability, introduced score histories for all quotes, optimized the player matching algorithm, introduced global ranking, more skill levels, added an Instant Death accuracy mode, support for 51 languages, added premium accounts, the ability to export your race history, a school edition, the Pitstop, customized avatars, Typeracer scorecards, and much more. 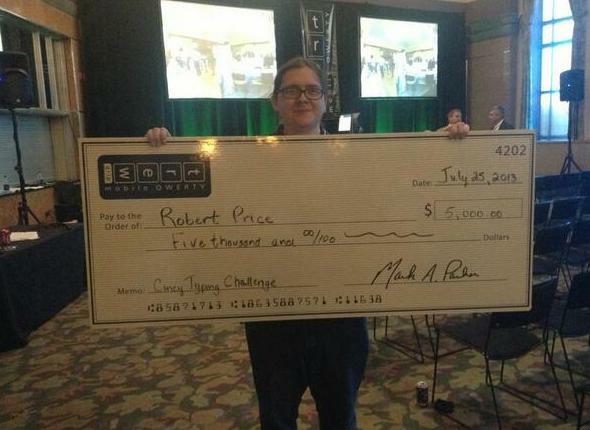 I have lost to this guy countless times, but I did win once! Sorry, Sean, I am posting this screenshot! 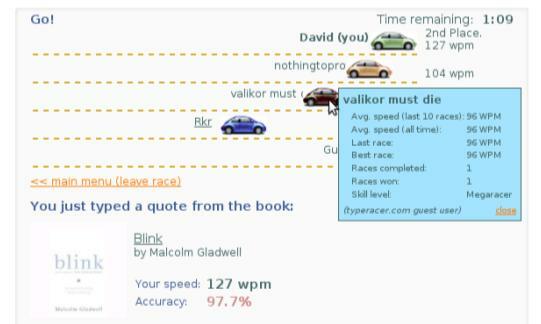 During this time, I have personally improved my typing speed from around 120wpm to around 140wpm (it is becoming more and more difficult to get faster!) I completed 10,000, and then 20,000 races. I beat the world’s fastest typist one time (he beat me maybe 100-200 times, but somehow I doubt he took any screenshots). 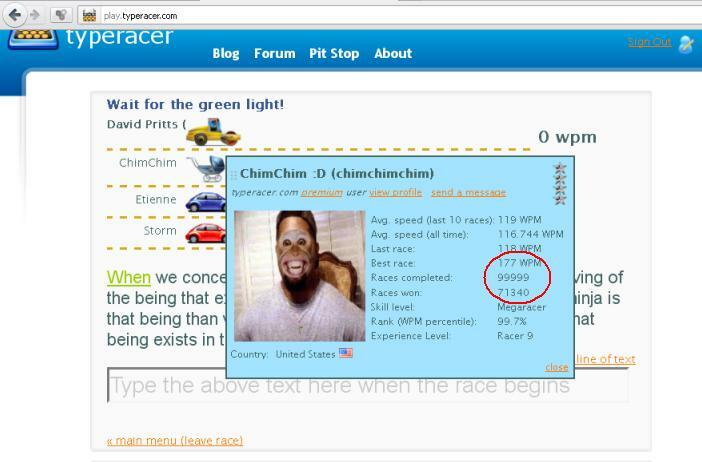 I also had the honor of racing against Typeracer legend Chimchimchim as he became the first person ever to complete 100,000 races on Typeracer! The one and only Chimchimchim, completing his 100,000th race on Typeracer! It was good to be there! In June 2013, I became Typeracer’s first employee. 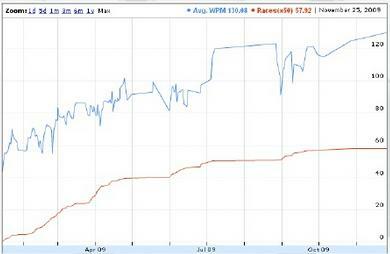 In just under 5 years, Typeracer grew into a game with 1,000,000 registered accounts (the latest number is 1,029,920)! There was too much work to do and not enough manpower to do it all, so it was time for Typeracer to expand. We have a lot of projects to work on. Typeracer supports 51 languages, but we are still relying on machine translations for most of these languages. 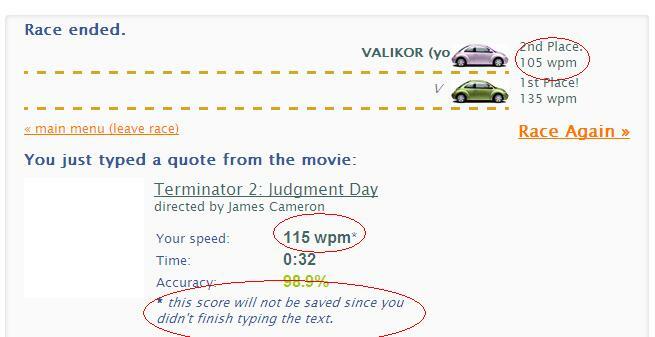 Despite countless hours of work developing anti-cheating measures, people still have found ways to cheat on Typeracer. Although we have hundreds of texts, there are thousands of dedicated players who have performed a large number of races, so we’ve already outgrown this selection of texts. Moving forward, we will be working on all of these issues, in addition to continuing to develop new features. Let us know what you want! Typeracer is going to be vastly improving its support for other languages. The most important point, though, is that today is Typeracer’s birthday fifth birthday, marking five years since Typeracer left beta. We want to celebrate by offering a promotion (for today only), dropping the price for premium memberships from $12/year to just $5 for a year. We hope you will consider supporting us! In addition, we want to make today special by adding some new texts, and deleting a number of cheaters who have made Typeracer less fun. Lastly, we want to announce an exciting new project, which is long overdue: starting today, we will be actively working to transform Typeracer International into a more fun and useful venue for typing in 51 languages. We want to get rid of all the texts which have been translated by Google Translate, replacing them with new texts specific to each language. If you speak any other languages, and want to help put together a collection of texts in your language, please contact me at David AT Typeracer DOT com. The Typeracer crew looks forward to working with Typeracer’s one million users in order to make sure that Typeracer remains the best typing website on the internet! Thanks, everybody, for your support over the years, and let’s wish Typeracer a happy fifth birthday! This balloon arrangement was put together a while back by Serbian Typeracer Zoran Markovic. I’m going to re-use it to celebrate Typeracer’s 5th birthday. Happy Birthday Typeracer!